PLEASE... ATTEND! Both services on Easter Sunday. The worst thing for guests and the ministry team is to have a congregation that seems empty. So, we are asking you to make the sacrifice of attending BOTH services on Easter Sunday. Two hours of your week + you being the wonderful you God made you to be….. I think Summer is here? The calendar would seem to suggest it but, the weather doesn't appear to be in full agreement yet! In any case, C3AK has an exciting summer on the books and I really hope you'll make plans to be involved, engaged, and available. Here are the TWO MAJOR undertakings we are working toward this season. Thursday nights June 7th - August 3rd, 6:30pm - 8:30pm at Heatherstone Park (MAP). Join us as we hangout and meet some of our South Anchorage neighbors. Take the opportunity to make friends, introduce the church, and share the Good News of Jesus Christ. GraceWorks mission teams will be taking care of the park setup and preparation of cookout foods... JUST SHOW UP! Mark your calendars to join us for every Thursday evening you can, rain or shine! The teams will also be ministering in the parks every weekday at 1:00pm. This is another opportunity where you can emphasize the relationships you are building. There won't be big games setup or cookouts going on but, especially if you have kids that want to have some time to run around and play, this would be a great way to share that time with some neighbors. 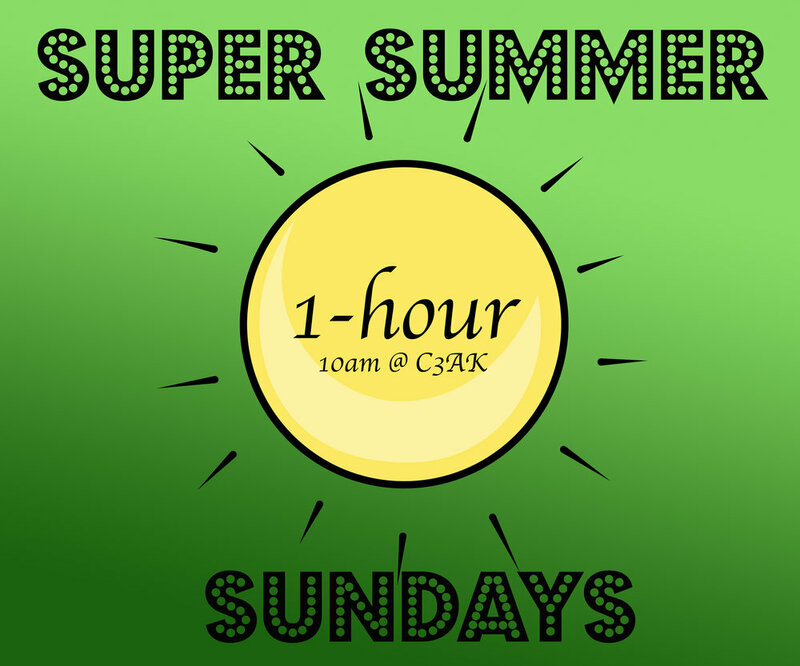 Don't miss out on our Super Summer 1-Hour Sundays - This will be our modified plan for Sunday morning services, which will never last for more than one hour! Lots of music, some media, and brief words from pastors and other voices in our church community. We know the summer is short, and we want to be good stewards of your time so you can enjoy as much as possible. Reorganizing our priorities in a way that may seem, initially, a little counterintuitive. From the Ed Stetzer blog, over at Christianity Today, comes a small review of a new book, from some of my favorite Christian humorists at the Babylon Bee. Take a look! "How can I tell if my kid is depressed?" Hey C3AK! Here’s the set list for this Sunday! The darker aspects of our modern, technological age, particularly as they relate to teen use of smartphones. Hey C3AK! Here’s the set list for this Sunday! I hope you plan to be there and worship with us! Until then, take a few and check out a new song we are planning to sing with you soon. It’s called “Trust It All”. I hope it speaks to you during your personal worship time today. The problem is they are wrong. And not just, "Oh, well, you get the general idea," kind of wrong. They are completely, insidiously, diametrically opposed to the heart and character of God. Music for April 22, 2018. "It is not good that the man should be alone," was God's first statement on the human condition. And from that moment on God's story, our story is full of group life.